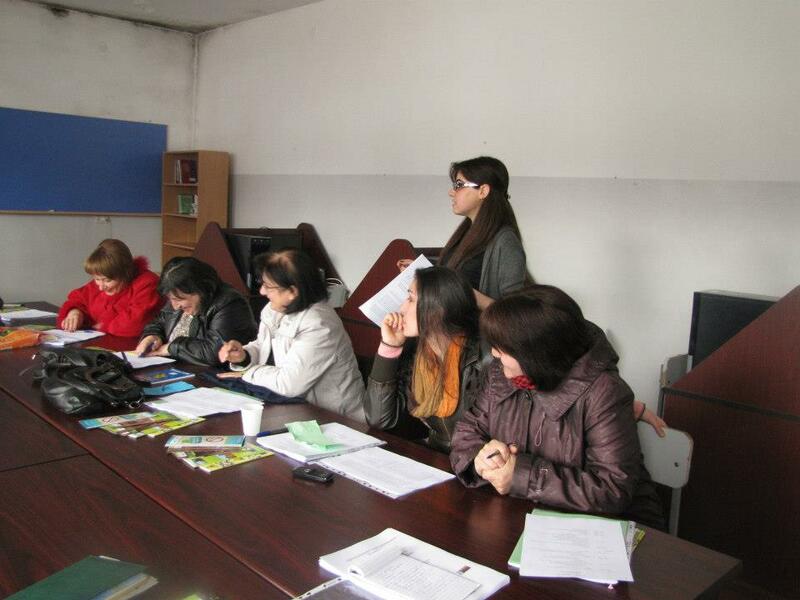 On March 27-28, 2013, AEN and Green Lane NGO conducted the second Training of Teachers (ToT) within the framework of the “Integrated Waste Management Project” in Berd. Before fulfilling the main objectives of the training we facilitated a discussion about the journal entries the teachers were instructed to write after the 1st ToT. The aim of record keeping was to see which lessons were difficult to adjust to, what changes they had to make, and more broadly, whether or not they worked in practice. This feedback would allow us to gauge the success of both our methods as well as the teacher’s guide we provided. Although only a few teachers had journal entries, many of them thought of even more creative venues of record keeping. Many of them video-taped their lessons thinking it would be easier to make improvements via this format. Because we are open to innovation and individuality we appreciated their efforts. Overall, the teachers’ assessment of the teaching and learning process was positive which encouraged us to proceed with the new material and method. We then moved on to fulfilling the main objectives of the program. The second part of the teachers’ guide is devoted to waste management and comprises four interconnected lesson plans with relevant activities. The first chapter reveals the positive and negative aspects of waste, and the importance of waste reduction and waste management. The second chapter is devoted to recycling and its benefits. 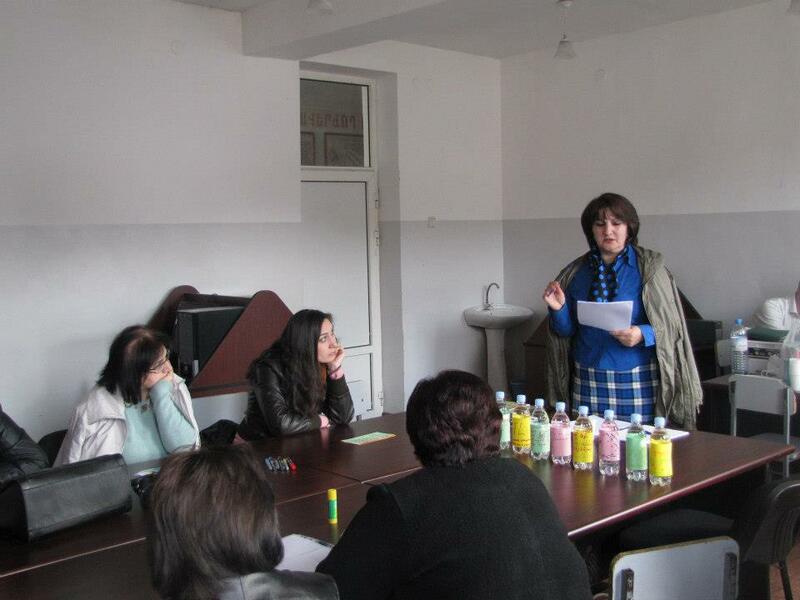 In order to ensure a better understanding of recycling we have developed a number of useful activities: paper recycling, identifying the recycling bins in Berd on the map, learning about the “Journey of Plastic Bottle” and many others. We also included an article, “Message from Midway”, that will encourage students not to pollute and to prevent dramatic consequences of pollution. The teachers were excited with the prospect that the article would inspire the students’ way of thinking and would make them think carefully before polluting the area. The third chapter highlights composting and its benefits for the community. Students learn what they can compost and make their own compost. The activities help them understand that the items they throw away as trash take a considerable time to decompose, making it important to create better waste management techniques. And finally the forth chapter is devoted to the concept of reusing what is considered waste. Students are introduced to a number of creative ways of reusing old items and are encouraged to put to practical use items they deemed as trash. They also learn about an interesting initiative that was implemented in London, known as “Films on Fridges”, highlighting the benefits of reuse as a means of waste management. The teachers highly appreciated the guide due to its practical value and community driven approach. Most of them were unfamiliar with the topics included in the guide and stated that they were of high importance as their community badly needed ways of waste management. They welcomed the exercise-game “Noah’s Ark” (developed based on the famous “Life Boat” activity) which is a good tool to promote critical thinking among students. The teachers also appreciated the press conference activity that practices Socratic Method (the method introduced during the 1stToT) and in fact is part of the new methodology we introduced, i.e Bloom’s Taxonomy. We modeled an article for the teachers and afterwards some of them expressed willingness to hold a “press conference” for the whole group based on some actual articles. We also provided the teachers with core rules of press conference activity and websites for students to search for interesting articles. As for the methodology, Bloom’s Taxonomy provides a measurement tool for thinking. The information package we provided the teachers also included the Planning Framework of Bloom’s Taxonomy with some basic activities that challenge students to move from the most basic skills (remembering) to more complex learning (creating). The teachers were asked to develop lesson plans based on the new methodology highlighting the creation element. On the next day we discussed some lesson plans and modified them to make use of the methodology as much as possible. The teachers seemed to know some levels of the taxonomy but most of them lacked tools to encourage their students to “climb” up to a higher level of thinking. All-in-all they stated that their students would learn the material and do the activities with great pleasure. As a part of the training Lia Asatryan from “Green Lane” NGO presented a number of useful ways of reusing items (a bag from an old T-shirt, a photo frame from a CD, and a self-watering plant holder from a plastic bottle). The teachers were excited and expressed willingness to practice it during their classes. At the end of the training we shared our ideas about holding a festival as a concluding stage of the two main educational parts of the teachers’ guide. The festival will enable the students to present their handmade/recycled/reused items, maps, pictures, etc. We asked the teachers to have the students brainstorm and come up with some interesting ideas/projects that can be implemented as a part of the festival. The festival is to be held on May 4th, 2013.